This is the 3rd battle between me and Mocaiv and the second between me and Bootcamp. This is my first 3 person battle. Below are some of my comments and thoughts on these games. Whoops! Forgot how many points we played: 500 points each (thanks to Techromancer for noticing this error). Chieftain with Mighty leap, Quills, Super tough frame and Defensive tumbling. English is not my native language so if you find any bad spelling mistakes the please email me to let me know, thanks. Left is a overview of what the different symbols mean and below is a map over the battle scene and where the armies where positioned for set up. The map is ofcourse not 100% correct but I tried to make it as real as posible. If you want to see why it is not accurate the click here to see my “notes” he he. The black lines is where the minis moved and the red lines is for shooting. I also lost track of turns somewhere since I didn’t mark up units that didn’t move for a turn, but I know how to get around this next time. 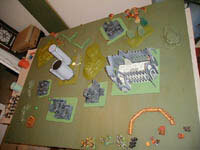 During the battle report there will be small photos and small battle maps. To see them larger just click on them and a large image will pop up. I have done it this way for two reasones: 1) so I can show all the images for people with small screen resolutions as well 2) to make this page smaller. I am writting the battle report as I experienced it and it might be altered by Mocaiv or Bootcamp later on. All images where taken by Mocaiv. The Battlefield before the war! Click image to enlarge As soon as the growler pack broke the edge of the forest the Neo Soviet Officer realized that the he was not only the hunter (and The imperial the prey). His force was being hunted as well. Seeing the open space between the Neo Soviet and The Imperial combined with the Imperial Trencher’s and Regular’s excellent position made the Officer choose to lead his force towards the middle of the battlefield and towards the Growlers. The Growlers saw the challenge and most of the pack headed towards the Neo Soviets. The only exceptions where the pups who chose to take a less risky route towards the Vanguards and one of the Bull’s who felt a presence behind the huge stone cathedral and decided to follow his instinct rather than his Chieftain. The Imperial Sovereign already in excellent shooting position moved slightly to get an even better position. Click image to enlarge With a huge Chrashing sound the Chieftain landed in the middle of the Neo Soviet Force, throwing everybody to the ground, killing a few Rad Troopers and wounding the Cyclops. This effectively decided the Neo Soviets tactics for many turns to come. The only one that wasn’t hit was the Rad Hound fortunately since it would have been a mess if it had blown up between the Neo Soviets around it. But since it was out side Close Combat the Officer could shout commands to it to advance towards other enemy troops. 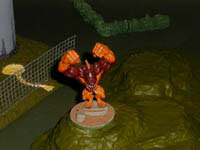 The Onehorns advanced towards both the other Cyclops and the Vanguards. 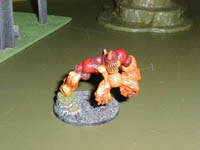 The cyclops manage to wound one while the Vanguards mange to killed a couple of the pups coming quickly towards them. The last Bull still felt the precense on the other side of the Chapel and using his instinct he started throwing piles of dirt over the building killing one of the Blood Berets who had just moved into cover of the building. The Regulars saw this and left their fireing position to help take out the Bull. The Trenchers stayed! Click image to enlarge The Onehorns charged towards both the Cyclops and the Vanguard but only one of the Onehorns manage to reach the Cyclops.But the rest of the Onehorns were closing in fast. The Pups charged the Vanguards, again only reaching with a few. The manage to kille a Vanguard in return for a couple of pups who fell to both the bayonets and shooting of the Vanguards. 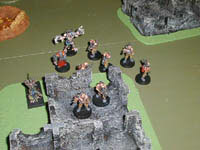 The Vanguards with Kalashnikovs shot at the Onehorn and manage to wound two of them without hitting the Cyclops. The Chieftain was engaged with the Officer, the Rad Troopers and the other Cyclops. He manage to wound the Officer and kill a Rad Trooper but was badly wounded in return by the Rad Troopers and the Cyclops. The Rad Hound ran forward towards the Onehorns but failed to reach due to the electronic leash in the Officer’s hand. Now the second Bull became aware of the Imperial forces behind the cathedral and ran forward to help the other Bull. Standing on top of the hill he now had a clear view of what was going on. The first Bull who was now trying to break down the walls itself but by doing so was exposed to the Blood Berets who opend fire and wounded him. To make matters worse the Regulars where moving quickly towards him as well. Click image to enlarge The Vanguards started shooting at the Onhorns killing or Damaging all of them. 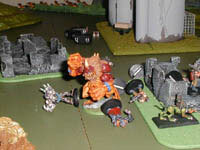 One Vanguard with Kalashnikov shot at the Chieftain not wounding him but managed to throw him to the ground making him an easy target for the Rad Troopers who started stabbing him. The Officer moved out of combat to give the Rad Hound the space it needed to run towards the Onehorns and blow them (and itself up) it only mananged to wound a Onehorn and kill itself. The Pups ran away and the first Bull ran for cover in the woods while the other jump forward to continue the battle with the Imperials. Captain “Chubby” Smith saw that the battle here was done but was also aware of the threat from either the Neo Soviet force or the Bulk of the Growler pack, whoever came out of the battle on top over there would be heading his way. So he left it to the Regulars to clean up while he headed towards the Neo Soviet line along with The Blood Berets. Click image to enlarge The Rad Troopers went first! Killing the Chieftain with their Bayonets. Now they felt invinsible and ran forwards towards the Imperial Line. 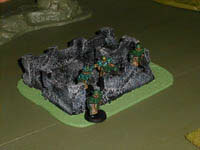 But the Trenchers never felt for the temptation to leave their shooting position knowing at some point one of the enemies would caome running towards them. They opened fire killing a couple of Rad Troopers. The Bull running towards the woods saw it’s rival, the other Bull, runnning towards the Regulars. Not one to let him get the honors of killing the petty humans, he turned around but fell to the hail of fire from the Regulars. 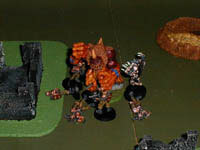 The Vanguards finished of the remaining Onehorns while the Officer led the two wounded Cyclops towards the Imperial troopers who was starting to concern him. 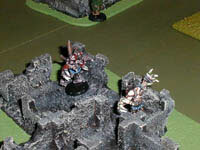 The Captain and the Blood Berets quickly moved forward and into cover. The pups were still running away. Click image to enlarge Shocked by the sudden apperance of the Regulars the Bull ran back to re-group with the pups. The Regulars followed with guns blazing but did manage to hit the big but fast creature. 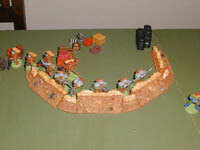 The Vanguards moved forward to the small ruin to take position for when the Imerial troops came. The shooting started the cyclops and the officer fired at the Blood beret and Captain Smith, who’s luck saved him a couple of times. But they did mangage to kill a Blood Beret. They in turn killed both the officer and one Cyclops. 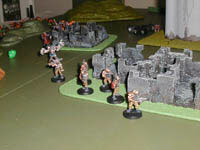 Then the Rad Troopers shot at the Trenchers, but with only 1 shot a turn they failed to kill any. The Trenchers however managed to kill more Rad Troopers.